In the quest to describe small molecule inhibitors with the ability to efficiently promote the differentiation of human pluripotent stem cells (hPSCs) into cardiomyocytes, researchers from the laboratories of Christina Li Lin Chai (National University of Singapore) and Steve Kah Weng Oh (ASTAR, Singapore) recently assessed the cardiomyogenic potential of analogs of SB203580, an inhibitor of the AKT and p38MAP kinases . This previous study identified TA-01 as a potent cardiomyogenic agent, and now, in a new STEM CELLS Translational Medicine article, Zhong et al. report on their quest to further improve on the activity of TA-01 via the synthesis of structural variants . Excitingly, the authors now describe the identification of new TA-01 variants that promote cardiomyogenesis through ALK5 of the TGFβ pathway and not the expected Wnt/β‐catenin pathway. The authors began their search for new small molecule inhibitors by screening over 50 novel synthetic tri‐substituted imidazoles (TA‐01 and SB203580 analogs [3, 4]) for their ability to promote the generation of cardiomyocytes from hPSCs, discovering that several compounds boosted differentiation when applied from days three to five of a primary embryoid body-based and a secondary monolayer-based protocol. Unexpectedly, the study discovered that the newly discovered small molecule inhibitors did not inhibit the expected p38α MAPK or Wnt/β‐catenin pathways, but instead, likely acted by inhibiting ALK5 of the TGFβ signaling pathway. Of note, this represents the first demonstration of enhanced cardiac differentiation via ALK5 inhibition and represents an unexpected to cardiomyogenesis route. Furthermore, the differentiation-boosting capabilities of the new small molecule inhibitors did not stop at cardiomyocyte generation; when applied for from days one to nine of a neural differentiation protocol (slightly earlier exposure than for cardiomyocyte production) they also potentiated the production of neural cells, also by the inhibition of ALK5. The authors hope that their newly discovered compounds, which can efficiently generate cells from two lineages depending on the timing of treatment, will promote the differentiation of clinical‐grade adult cells for future cardiomyocyte and neural cell therapies, drug testing, and cell tissue models. For more on new small molecule inhibitors, the construction of efficient hPSC differentiation protocols, and the mechanisms involved, stay tuned to the Stem Cells Portal. Laco F, Low J-L, Seow J, et al., Cardiomyocyte differentiation of pluripotent stem cells with SB203580 analogues correlates with Wnt pathway CK1 inhibition independent of p38 MAPK signaling. Journal of Molecular and Cellular Cardiology 2015;80:56-70. 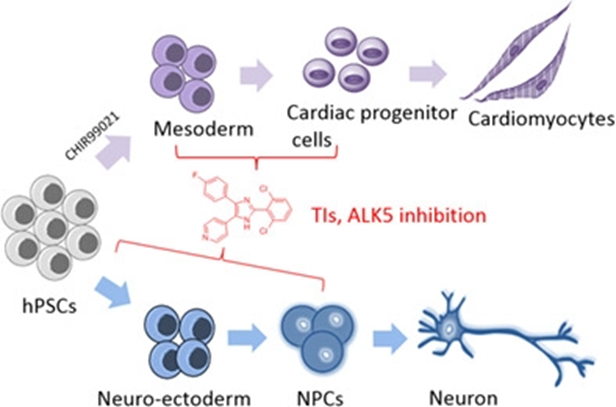 Zhong Q, Laco F, Liao M-C, et al., Influencing the Fate of Cardiac and Neural Stem Cell Differentiation Using Small Molecule Inhibitors of ALK5. STEM CELLS Translational Medicine 2018;7:709-720. Laco F, Low JL, Seow J, et al., Cardiomyocyte differentiation of pluripotent stem cells with SB203580 analogues correlates with Wnt pathway CK1 inhibition independent of p38 MAPK signaling. J Mol Cell Cardiol 2015;80:56-70. Gaur M, Ritner C, Sievers R, et al., Timed inhibition of p38MAPK directs accelerated differentiation of human embryonic stem cells into cardiomyocytes. Cytotherapy 2010;12:807-17.